Does Mistletoe have a place in modern Cancer Therapy? Informed patients who discover they have cancer often face an agonizing decision as to their treatment options. They are concerned about the potential side effects of main stream cancer therapy, but they have also heard of other complementary or alternative therapies yet are unsure of their effectiveness. They will seek medical advice from different sources: the conventional doctor will urge them to follow conventional cancer treatments; the over-zealous health practitioner warns them to avoid orthodox treatment for fear of toxic side effects or aggravation of the cancer. How do they arrive at an informed decision that will offer them optimal benefits? And how do we as informed health practitioners guide them in the right direction? Mistletoe has been used by medical doctors as an effective cancer treatment for over 80 years; it is non toxic and supported by sufficient scientific evidence to justify serious consideration in the overall cancer treatment protocol. 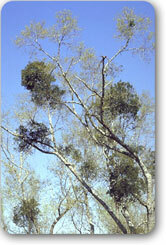 Mistletoe is a semi-parasitic, bushy plant that lives symbiotically on a number of different host trees. 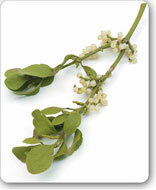 Only the white-berried mistletoe species, Visum album, is used in cancer therapy. It grows on deciduous trees like oak and apple, and coniferous trees like pine and fir. In ancient times mistletoe was regarded as a sacred plant, it was only cut with a golden knife and never allowed to touch the ground. Its botanical features indeed demonstrate remarkable differences to most other plants: e.g. it avoids direct contact with the earth, growing only on trees and has in contrast a strong affinity for the light, e.g. it needs light to germinate (most other plants need darkness), and photosynthesis occurs so intensely that chlorophyll is formed even where it roots into the dark interior of the tree. Mistletoe contains a number of biologically active substances, but two groups of protein-type toxins appear to be the key constituents: these are viscotoxins, which are able to break down cancer cells, and mistletoe lectins which can inhibit the growth of cancer cells. Rudolf Steiner, the Austrian philosopher-scientist and spiritual teacher, first discovered in 1917 that injections of mistletoe plant extract could be used in the treatment of cancer. Dr Ita Wegman, a specialist gynaecologist, then successfully used mistletoe in her practice, leading to development of special methods of processing the extract into a specific cancer treatment. Iscador, one of the trade names of Mistletoe treatment is prepared by subjecting the summer and winter harvests of mistletoe extract to a fermentation process using Lactobacillus plantarum, then mixing it under high speed, filtering it to remove the bacteria, adding various admixtures before standardizing it and packaging it into ampoules. Is there a scientific basis for including Iscador in the treatment of Cancer? Iscador is the most researched of a number of mistletoe preparations. Over the last 50 years, some 1500 research articles have been published on mistletoe, concentrating largely on the biological activity, toxicity, anti-cancer activity and immunological action. Recent reviews of the literature confirm the biological activity of mistletoe extracts, indicate no significant toxic effects when used as directed, suggest an inhibition of cell growth, anti-tumour activity and improved immune function in animal studies. Several studies show improved immune function, quality of life and survival. An overview of case studies and clinical trials by H. Kiene indicates that certain of the case records include some noteworthy case studies. This is also the experience of many practitioners who have been actively using mistletoe therapy in their practices. Some of these controlled trials produced statistically significant results. Currently a number of clinical trials are being conducted internationally, whose results are not yet available. At the present time ISCADOR or other mistletoe preparations cannot be regarded as a cure for cancer. We would not advocate it solely to treat an established tumour when conventional cancer therapy has shown benefits. However given the fact that it s non-toxic and that certain studies indicate its potential value in the treatment of cancer, we would strongly advocate its use as an additional supportive treatment alongside conventional cancer therapies, to stimulate the immune system and hence increase body defences. This standpoint comes from 30 years’ experience using ISCADOR in general practice. It may have special value in patients who have an increased risk of cancer, eg cervical dysplasia, ulcerative colitis, Crohn’s disease, polyps and papilloma of the bladder and colon, HIV/Aids, leukoplakia. It also has a place in advanced cancer, where it appears to prolong and improve the quality of life. It may in addition be used as a powerful preventative therapy to stimulate the immune system. It is generally accepted that the cancerous growth is the visible end stage of a cancerous or pre-cancerous state that has existed for years. One can describe this disease as a profound disturbance in equilibrium between processes which maintain healthy form and function (represented by the immune system) and cell proliferation (natural cell tendency). It is this fundamental disturbance that mistletoe aims to correct, on the one hand through its immune modulating properties, on the other through its cell inhibiting potential. ISCADOR is usually injected subcutaneously with a fine disposable needle several times weekly close to the tumour site. The patient or a family member is taught to administer the injection and the course comprising 14 injections is designed by the practitioner according to the patient’s condition, with respect to the type of mistletoe, dosage and frequency. In our experience, it is necessary to treat an established cancer for months or years. Dr Raoul Goldberg has been actively working with Iscador since 1975 after training in the Lukas Cancer Clinic, Arlesheim, Switzerland.